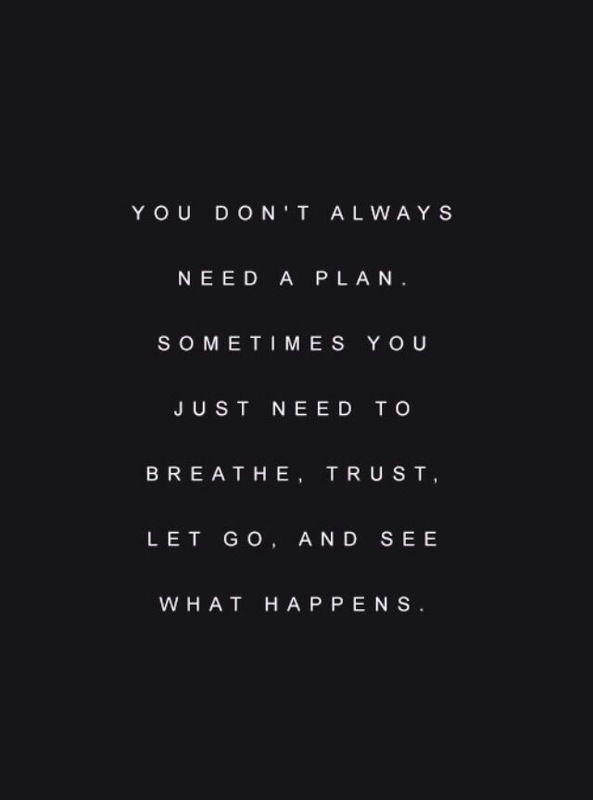 Wise Words: Breathe. Trust. Let Go. The world just seems to be on fast-forward. Like all the time. And I’m not sure about you but, to me, it feels like you should have a plan. There seems to be this need to have one. Now don’t misunderstand me. I understand the importance of at least having an idea of how you want things to go. Planning has its time and place. What I’m referring to is when planning turns into this rigid scheduling that ends up exhausting you. When what you plan becomes the sole focus and takes over every aspect of life. When your plan is so rigid that it sets you up to feel like a failure. There are times I feel judged for not have a detailed, step-by-step life plan for the rest of my life. The truth is I was one of those people. Maybe not the down-to-the-last detail kind of planning, but I had this idea of what life is supposed to look like (graduate high school with a diploma, go to school for a degree, find a home, get married, have kids, work, then retire–something like that) and then life throws you a curve ball. You get the rug pulled from under you and all of a sudden your plan just doesn’t make sense or there is no way your plan will work given your new circumstances and yet you keep trying to follow your original plan. Am I rambling? It seems like I’m rambling. Point is, sometimes you just need to breathe. Trust. And let go. Which is why this quote is relatable. For me, I plan the major things (family parties through the year or a doctor’s appoint on my next day off, things like that). Then I keep a general idea of what I want done and just go with it. It’s scary at times and, again, those looks of judgement catches my eye once in a while, but for the most part I can breathe easier. I don’t feel so confined or like I’m a disappointment because Step B did not come directly after Step A.